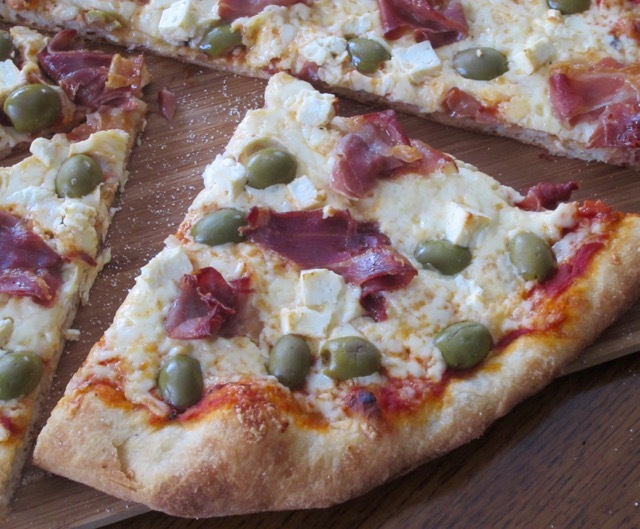 If you don’t like green olives you can substitute them with the black ones. The pizza was amazing. We usually have pizza once a week. I have been trying to make a different one every time, but I seem to be running out of ideas. Have a pleasant week. Preheat the oven to 475ºF (245ºC) if using a pizza pan or 550ºF (290ºC) if using a pizza stone or as per instruction on you pizza dough packet. If using a stone, preheat the oven with the stone inside, on the bottom rack; if using a pan use the middle rack. The pizza will bake in 8-15 minutes depending on your oven. Roll or stretch the pizza dough and place on a lightly greased pizza pan or a pizza peel sprinkled with corn flour or semolina, if using a pizza stone. Spread the pizza sauce over the pizza crust. Sprinkle the rosemary over the pizza sauce and then top with the grated mozzarella. 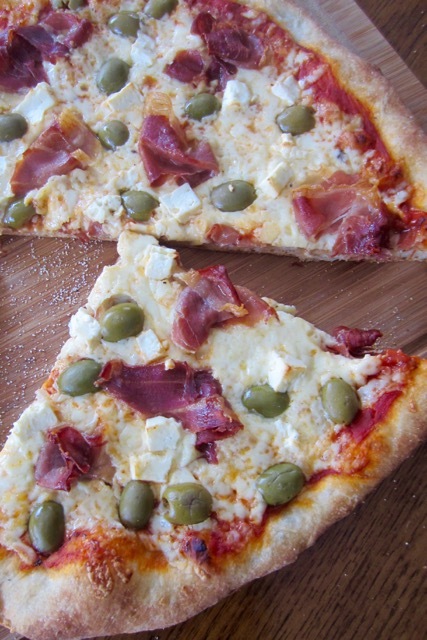 Arrange the prosciutto, green olives and the crumbled Feta. 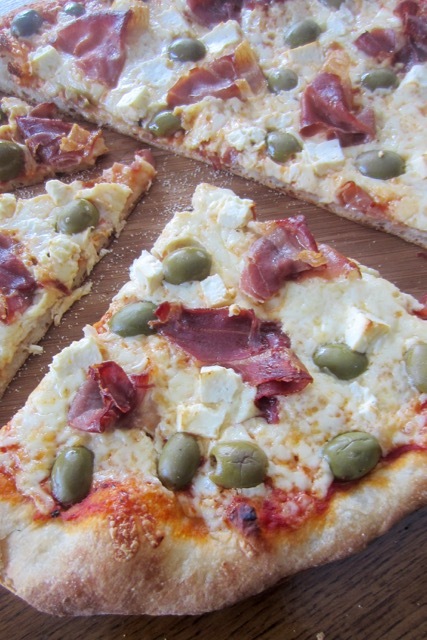 Transfer the pizza to the oven and bake until the crust is golden brown, 8-15 minutes depending on your oven. Roll or stretch the pizza dough and place on a lightly greased pizza pan or a pizza peel sprinkled with corn flour or semolina, if using a pizza stone. Spread the pizza sauce over the pizza crust. Sprinkle the rosemary over the pizza sauce and then top with the grated mozzarella. 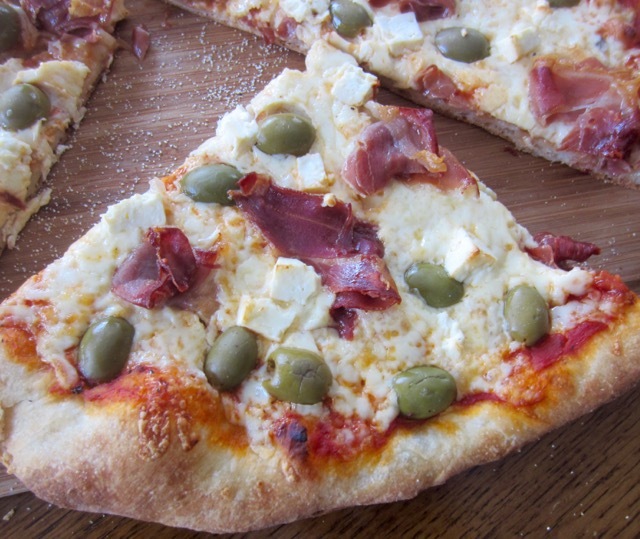 Arrange the prosciutto, green olives and the crumbled Feta. 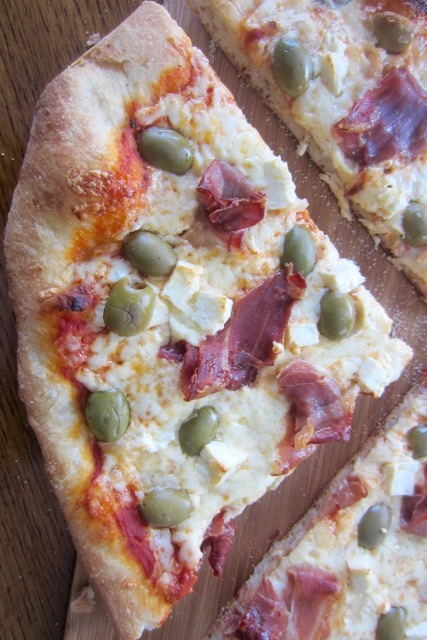 Transfer the pizza to the oven and bake until the crust is golden brown, 8-15 minutes depending on your oven.